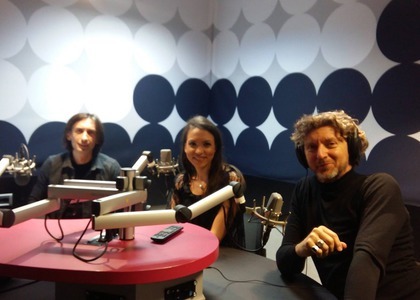 This week's guest on Perpetuum Mobile on November 14 was choreographer Renato Zanella, alongside journalist Evelin Păuna, who spoke to Gabriel Marica. We have choreographer Renato Zanella here in the Radio Romania Muzical studio. Good evening and welcome! And joining us is Eveline Păuna, a journalist and collaborator of the Excelsior Dance Workshops Project. I'll start with you, Eveline! Good evening! It's good to be here. I'd like you to tell our listeners where the idea for the workshops came from and to whom they are addressed. The Excelsior Dance Workshops are a project of the Excelsior Theatre. I have to thank manager Adrian Găzdaru and assistant manager Maria Rotaru. Since the beginning - as this is the second edition - we wanted to offer young dancers the chance to meet with established names from the international dance stage. It's the second year in a row that we have the honour of having with us maestro Renato Zanella who, for the first time in Romania, offers such an opportunity to children and young people. It is, in fact, a national premiere. Up until now, no other dance personality of his calibre has offered such an opportunity to young people who are not part of a professional company. Renato Zanella was the ballet director of the Vienna State Opera, of the Greece National Ballet, but he has also collaborated with the ballet of the National Opera House in Bucharest for one season. How was the collaboration with the Bucharest Opera? It was great, very creative for me. I found a beautiful family there. I think my work is not yet over here, so you never know. Renato Zanella was a dancer, now he is a choreographer with an impressive résumé and shows that have been successful worldwide. Please tell us what's more difficult - being a dancer or a choreographer? Being a choreographer is truly more complicated. Because you have to find the right dancer and be able to make him convey your idea in his movement. It's more difficult because it's not only up to you, it's up to the dancer as well. What do you prefer - classic ballet or modern dance? I like classic dance when performed skillfully, at a high level, but I also embrace the idea if modern dance and support it because it's the evolution of dance, it's the future of dancing. Do you have a favourite composer? Any particular musical work that inspires you? It's a difficult question, but my favourite composer is always the one for which I am working, to whose music I am doing the choreography. Now, in Seoul - Korea, we did Shostakovich. The last works here were Stravinsky's and Beethoven's. Then there was Romeo and Juliet, which I created in Bucharest… so a very wide range. I truly love music. Let's talk now about the event on November 18. I know that there will be some workshops until then. What are your impressions, as of now, regarding the young people who take part in them? I think the meeting between them is extraordinary. I like the way they look at me and try to absorb everything I tell them. I'm almost shocked by the technical level some of them have. Although very young, their level is impressive. You really do have good schools here in Romania! On Sunday, November 18, at 19.00, at the Ion Lucian Hall of the Excelsior Theatre in Bucharest, there will be a performance of the show "Invitation to a Dance" - an experimental show by Renato Zanella. The first part will be an interview conducted by you, Eveline, and in the second part, Mr. Zanella will explain his choreographic vision. I think it's an interesting idea because the audience never knows what happens behind the curtains in the world of dance - how we train, how we stretch, how we work on the middle parts, on the solo, and why not? It will be interesting to see fragments of the work behind a career. I wish I have time to polish everyone's talent and showcase each and every dancer, but time is against us, I have to admit. The art of dance is very old, we don't have instruments. The body is our instrument and it is the permanent bond between dancers, it's all we have to carry dance forward. And so we get to the third part of the experimental show on Sunday, where you will perform a show with those who took part in these workshops, am I right? Yes, we'll work with the dancers. I'll try to stage with them what I staged with professional dancers from famous companies. I'm trying to translate the language of dance, and this is what dancing is all about, actually - to pass something on. We work with young dancers, with students. We emphasize this idea - it's not a professional company, it's about young people who want to become professionals someday. We won't have costumes or make-up. It's basically a public rehearsal to show the link between generations and what happens behind the curtain when it comes to the study of dance. I'm always very nervous when I think about meeting young dancers because parts of what I might tell them could create certain expectations or tensions. So I'm always very careful about what I tell the dancers, but I think there will be some truly beautiful moments on Sunday. I can't help but ask this: what's next after "Invitation to a Dance"? What other projects do you have in store? I have a choreographic center in Austria now, dedicated to choreographers. It's something that hasn't been done before at this level. I came back from Seoul. I will go to Albania and stage some shows there. So, apart from my career as a freelance choreographer, making beautiful shows all over world, I also want to focus some of my attention to this as well - the choreographic center in Austria. I have met many talented people all over world and I don't think they have the financial means to achieve their dream, so I try to help them, give each and every one of them an opportunity. I know you have to get to the "Nutcracker" show at the Bucharest National Opera, so I won't be keeping you long, although I would have wanted to talk some more. Eveline, an invitation for Sunday for the listeners of Radio Romania Muzical! Thank you for the invitation to be part of today's show with you, and we're expecting all of you on Sunday, at 19.00, at the Excelsior Theater, for an unforgettable and unique evening with the one and only Renato Zanella.